Pretty sure this was 1977. This must be pretty rare. It's actually from 1976! 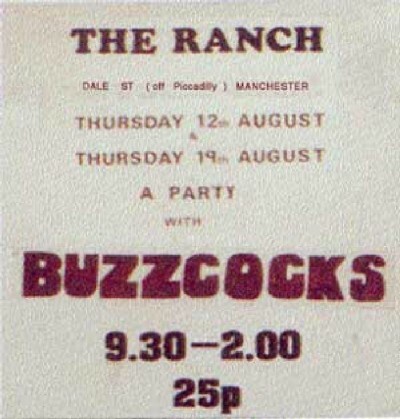 Probably one of the earliest Buzzcocks artefacts I've seen. Yeah it's definitely from 1976, I checked it in Tony McGarland's book about the band. nice- is this yours stuart? did you go to the gig? No it's not mine, I can't remember where I saw the picture now. Never went to the Ranch. Brilliant club, vague recollections of these gigs. We were spoilt for choice back then as it felt like there was some one playing somewhere every night. Hi Ian what did you play in the band Nervous Breakdown ? ?